November soybean finished at $9.77 ½, down 5 ½ cents December soymeal at $294.70, down $1.50 and December soybean oil at 36.94, down 16 points. Export sales were 654,500 MT above the range of trade guesses that were between 450,000 and 650,000 MT. China and Taiwan were the main buyers despite the Chinese being on holiday for much of the period. The US harvest continues to lag, and planting is now underway in South America, with record production expected from all the major players. December corn closed at $3.72, down 1 cent, March closed at $3.83 ¾, down 1 ¼ cents. Export sales were on the low end of trade estimates with net sales at 631,800 MT. A slightly drier outlook for the next few days should allow some advancement in US harvest activity, Crude oil hit its highest levels in twelve months, which is adding a bit of support to corn. Taiwan purchased 52,000 tonnes of Brazilian corn overnight. December wheat closed at 4.98 ¾, down 6 ¼ cents. Export sales were 480,200 MT within the range of trade estimates of 450,000 to 650,000 MT. Today's CFTC report showed a significant decrease in net short positions by the Large and the Small Speculators totaling 14,577 contracts. South Korea purchased 23,500 tonnes of US wheat but Egypt passed on US (and Russian wheat for once as well) booking 180,000 MT of French wheat. EU wheat closed a volatile week mostly lower Friday with November Paris milling wheat down EUR0.25 at EUR126.50/tonne, and London November feed wheat ending down GBP0.30 at GBP100.50/tonne. A wildly fluctuating forex market has seen the wheat market all over the place this week. Yet on the week as a whole London November feed wheat fell GBP0.50/tonne, whilst November Paris milling wheat rose EUR0.50/tonne overall. The pound closed last Friday at 1.5836 against the dollar, and by Tuesday it got within a whisker of falling below 1.57, before doing a complete turnaround and closing at 1.6350 on Friday. Sterling has also traded in a range of 91-94 pence against the euro this week, staging its best one-day rally in eight months against the euro on Friday. The sudden improvement in the pounds fortune can be attributed to comments by BoE Markets Director Paul Fisher. He says that QE is working and that the BoE might take the luxury of pausing its bond purchasing program in the face of a tentative recovery. The minutes of the BoE's last rate decision are due out on Wednesday. These will be scrutinised for evidence that Fisher is speaking for the MPC as a whole, rather than simply 'talking out of his hat'. That's right, after a string of disappointing - verging on the downright bloody awful - economic releases, no data whatsoever came out today. And that my friends is all it takes to get the pound moving upwards it would seem. It seems as though Sterling is playing of catch-up, after being beaten down heavily in the last couple of weeks on fears over a misguided and counter-productive monetary policy. Assurances today from MPC member Fisher that quantitative easing is now working seem to have been enough to spark what must be a short-covering rally. I for one can't believe that we won't be back under the cosh again next week. Legislation introduced by the EU earlier in the year to slap an import tariff on heavily subsidised US biodiesel to prevent it being dumped on the European market isn't working, according to Raffaello Garofalo, secretary general of the European Biodiesel Board (EBB). He says that the loophole exploited by America was so lucrative that it still pays US exporters to send their biodiesel to Europe via intermediate countries such as Canada, Mexico, Singapore and Turkey. And that is precisely what they are doing, according to Garofalo. Exactly why anyone should be surprised about that is beyond me. Isn't that so bloody typically European? After years arguing the toss we finally pass some legislation do something about it only to leave another giant loophole for them to climb through for another five years. I think we should have a bloody good committee meeting about this, a referendum and twenty seven postal ballots, three shows of hands and a lengthy adjournment. That'll teach them to mess with us. With the EU-27 rapeseed harvest done and dusted, Oil World have increased their production estimate to 21.1 MMT, 0.8 MMT up from their previous forecast of 20.3 MMT and 11.6% higher than the 18.9 MMT produced in 2008/09. Output in Europe's largest producer Germany is now seen at 6.3 MMT (5.2 MMT in 2008/09). Elsewhere, in France production is now pegged at 5.6 MMT (4.7); in Poland at 2.4 MMT (2.1), in the UK at 1.9 MMT (2.0), and in the Czech Republic at 1.1 MMT (1.1). French analysts Strategie Grains have cut their estimate for EU soft wheat production by 1.1 MMT from last month's estimate to 129.0 MMT. All wheat production in the EU-27 is now pegged at 137.1 MMT. 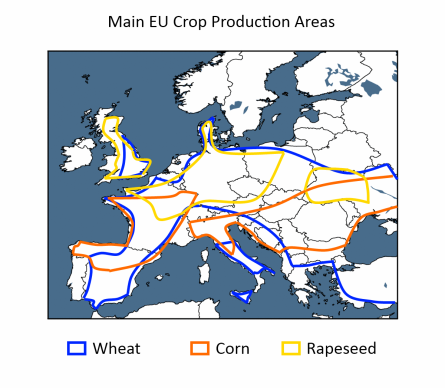 Average yields across Europe were left unchanged at 5.7 MT/ha. The fall in output comes from a lower planted area, dropped 100,000 hectares to 22.6 million ha. The figures come a day after the French Ministry dropped it's estimate of soft wheat production there by almost 1 MMT to 36.6 MMT. Now that the harvest is in, it would seem that we are not quite as awash with wheat as it seemed a couple of months ago. At home in the UK, final wheat production is now seen at 13.9 MMT by the NFU, up to 14.2 MMT by Defra. Both numbers are significantly below mid-summer estimates of around 14.7 MMT. In addition, despite nobody wanting the wheat that we are awash with, UK exports in the first two months of the marketing year were actually 42% higher than they were at the same time last year. November soybeans closed at 9.94, up 1 cent October Soybean Meal at 336.00, up 9.70 points October Soybean Oil at 35.95, up 9 points. The NOPA crush for soybeans for September was 107.4 million bushels, below expectations of 113 million. Snow will be in the picture for the Northern Plains and WCB today and Thursday with another round of mainly light rain and some snow for much of the Corn Belt for the start of the weekend too as another slowly crosses, say QT Weather. This will continue to hamper harvest activity with only 23% of the crop harvested compared to 49% last year and 57% for the five year average. December corn closed at $3.83, up 1 ¼ cents, with March corn at $3.95, up 1 ¾ cents. As the harvest drags on this afternoon's forecast is calling for above to much above normal precipitation for most of the US from October 20th to the 24th. Crude oil prices are also helping corn values as crude is very close to 2009 highs. The corn harvest is only 13% done compared to 20% last year and 35% for the five year average. December CBOT wheat finished the day at $5.13, up 1 ¾ cents. Iraq purchased 200,000 tonnes of hard red winter wheat for 2009/10 shipment. Egypt announced this afternoon they would tender for 30-60,000 MT of wheat for shipment in the last half of November, first half of December from option origin. The delayed bean and corn harvest is bullish for wheat too as it may prevent some winter acreage from getting into the ground. Short-covering and unwinding of bean/corn longs against wheat shorts has also been a feature of recent sessions in the wheat pit. What the hell is going on? Last week there was some consternation when Reuters and Dow Jones both released stories saying that the Argy wheat crop was down 18% on last year. What's so confusing about that I hear you ask? Well, Reuters said that it was down from 9.2 MMT to 7.55 MMT, according to the Buenos Aires Grains Exchange. DJ said it was down 18% to 7.1 MMT, according to the the Buenos Aires Grains Exchange without specifying from what figure last year, although that would imply down from 8.4 MMT. Today Reuters report that the Buenos Aires Grains Exchange have dropped their estimate this week from 7.55 MMT to 7.50 MMT. Also today DJ report that the Buenos Aires Grains Exchange's FIRST estimate of the season pegs the crop at 7.5 MMT, down 18.5% from last year. Now first off, the Argy crop for 2008/09 has been widely reported for months and months at 8.3-8.4 MMT, depending on who's figures you run with. It was certainly not 9.2 MMT with anybody. Secondly, how can DJ be reporting on the Buenos Aires Grains Exchange's FIRST estimate of the season when they reported an estimate last week? Thirdly, how can that estimate have improved by 0.4 MMT according to DJ and decreased by 0.1 MMT according to Reuters???? Fifthly, what happened to fourthly? Sixthly, if they can't decide even now how big the 2008/09 crop that was cut almost twelve months ago, how the flippin Nora can we put any faith in their estimate for 2009/10?? EU wheat closed lower Wednesday with November Paris milling wheat futures down EUR0.25 at EUR128/tonne, and London November feed wheat closing down GBP1.45 at GBP103.25/tonne. A weaker dollar, and firmer pound and euro prompted some selling at levels around GBP10-12 and EUR9-10 higher than recent lows. UK consumers still report that farmers are generally reluctant sellers, buoyed no doubt by recent price rises. 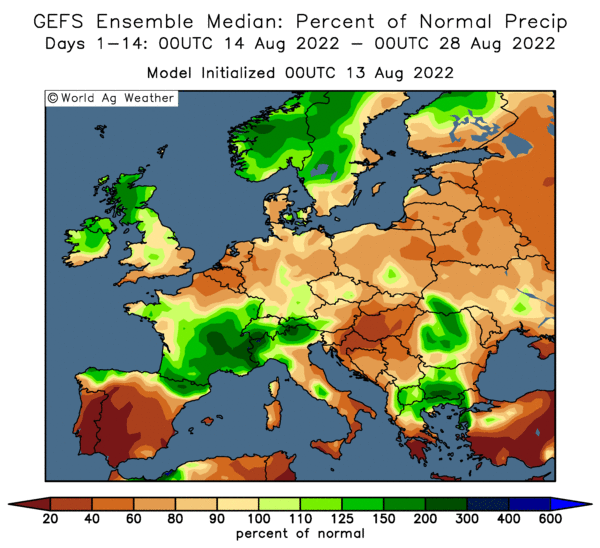 Although exchange rates went against UK wheat in particular today, many pundits are forecasting much lower rates to come by the end of the year, which should be supportive for UK wheat. Official figures released today show that UK exports are actually running significantly higher this marketing year than they were twelve months ago. That is an interesting statistic considering that we had around 3.5 MMT to export in 2008/09, compared to only around 2.25 MMT this season. 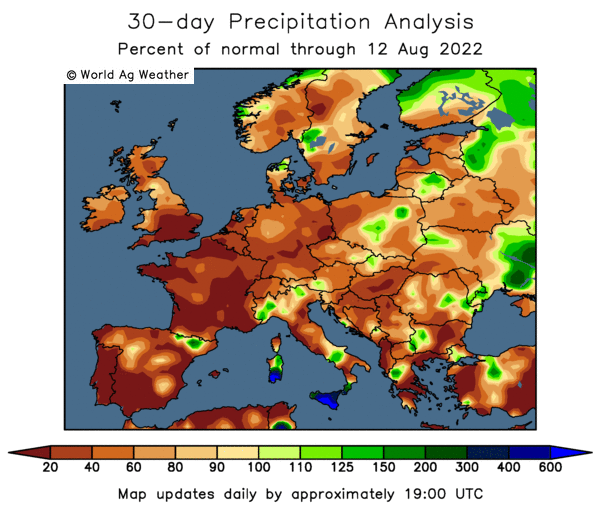 Also of interest is the news that the French Ministry dropped it's estimate of soft wheat production there by almost 1 MMT to 36.6 MMT. The overnight markets closed with beans, corn and wheat all around 3-4 cents higher, aided by a weak dollar and firmer crude oil. Crude hit it's highest levels of the year earlier today ($75.17/barrel), currently standing just below that at $74.94/barrel, helped by firmer equities and a weak dollar. Last night's crop progress report said that soybeans were just 23% harvested compared to 49% last year and 57% for the five year average. Also behind is corn at 13% harvested compared to 20% last year and 35% for the five year average. The NOPA crush for soybeans for September was 107.4 million bushels, below expectations of 113 million. China's soybean imports in September came in at 2.75 MMT, down from levels around 4 MMT in the summer, but in line with expectations. Ideas are that imports will start to pick up again November onwards back up to around the 4 MMT/month mark. China only sold 119,000 MT of corn at it's regular weekly auction. There's plenty of rain in the US forecast for the next ten days, although temperatures are seen warming up somewhat. Quality might be becoming an issue, once the crops are finally harvested. The lateness of the bean and corn harvest is also seen as bullish for wheat, as planting oportunities may be restricted for winter wheat. Early calls for this afternoon's CBOT session: December corn called 2 to 3 higher; beans called 3 to 5 higher; wheat called 2 to 4 higher. Ukraine expects to harvest almost 9 MMT of oilseeds in 2009, including 6.1 MMT of sunflower, 1.9 MMT of rapeseed and almost a million tonnes of soybeans, say Ukroliyaprom. Farmers sowed over 6 million hectares of oilseeds this year, say Ukroliyaprom, including 4.16 m ha of sunflower, 1.4 m ha of rapeseed and 600,000 ha of soybeans. A rapeseed crop of 1.9 MMT would be down by more than a third on last season's bumper crop of 2.9 MMT. UkrAgroConsult peg this years crop at 1.85 MMT. Despite an anticipated fall in grain production of around 20% this season, cash-starved Ukraine continues to export grain ahead of even last season's record pace. Up to Oct 13th over 7.5 MMT of grain (just over 4 MMT of it wheat) had been exported in the current marketing year which began on July 1st, according to Ukrainian Agriculture Minister Yuriy Melnyk. That's 240,000 MT more than at the same time a year ago. This season's grain harvest will total 42.9 MMT, said Melnyk, down sharply from 53.5 MMT a year ago. Exports in the current marketing year will total 16.69 MMT he said, a third lower than the 25.2 MMT exported last season. That means that just fifteen weeks into the marketing year, Ukraine have already exported 45% of their target for the entire year. That's some going that is. If ever there was a time to sit back and let the cheap distressed sellers offload their wheat at whatever price they can get for it, then this must surely be it. So what's going on? The country with easily the lowest credit rating of all the major global wheat exporters needs cash desperately. The IMF are in town, and Ukraine has violated the terms of it's deal agreed back in November 2008 to stabilise the Hryvnia and increase subsidised gas tariffs by September 1st. With an election looming the government have failed to deliver on either promise, and the IMF may now decide to withhold the final $3.8 billion tranche of the $16.4 billion handout agreed last winter. Against a backdrop like that, it's not remotely surprising that grain is pouring out of the country, with price an almost secondary issue. Let them get on with it I say, why bother trying to compete with that? One interesting topic that popped up at the conference I was at yesterday came from a lady from DairyCo talking about the expanding market for milk, and dairy products, in China. It's not something I had given a lot of consideration to before. With the growing appetite for a more westernised diet amongst China's younger consumers for things like say pizza, there could be some potential for significant growth here in the world's most populous country, she said. China's milk beverage industry is apparently considered by some to be the next hot spot for soft-drink giants. This morning I read of Coca-Cola launching its first dairy drink in China this week. The Minute Maid Pulpy Super Milky drink, is a mixture of fruit juice, milk powder and coconut bits and will be sold in 300 cities across China by the end of the year. The milk content of the drink is currently imported from New Zealand, however there is the possibility that if it takes off then the drinks giant may cooperate with domestic dairy enterprises. What are the implications for the feed market of China suddenly becoming a big new consumer of dairy products? Interesting. President of Russia's Grain Union Arkady Zlochevsky says that proposals to form a Black sea grain pool between Russia, Ukraine and Kazakhstan will become a reality "sooner or later, it is only the question of time." With each country competing head-to-head for business on the global export front, they are merely contriving to drive Black Sea grain prices lower by at least USD 10/tonne, and as much as USD20/tonne, he says. Having already teamed up with Belarus and Kazakhstan in an attempt to fast-track accession into the WTO, it seems like Russia are keen to reform strategic alliances with it's FSU neighbours. Certainly some sort of stabilisation of Black Sea grain prices, rather than the gung-ho 'lets take whatever we can get' approach that we have at the moment should only be good news for European export hopes too. There's not a lot of love lost between Ukraine and Russia however, who can forget last winters highly public spat over gas supplies? Blushing Ukraine is unlikely to be a willing partner in such a union, however they also have plenty of troubles of their own and may ultimately be forced into bed with their incestuous Uncles reeking of vodka. India's Junior Ag Minister K V Thomas has moved to assure the hungry Indian public that there is no need to worry, he's got everything under control. There's plenty of food to go round the 1.1-1.2 billion population, and there's no need to even think about imports. The assurances come after the worst monsoon rains since 1972 have been followed by severe flooding, killing hundreds of people, and rendering millions more homeless, and destroying or washing away millions of acres of cropland and contaminating grain stocks. The wheat market seems to have got fed up waiting for the government to release some of it's mythical stocks onto the domestic market, hitting contract highs this morning. The stocks, now reported at 32.6 MMT by one leading news service, appear to have actually INCREASED by a million tonnes from official figures as at the end of July. One can only assume that some magical powers have been at work, either that or a million tonnes more insects have taken up residence in the government-owned stocks. Either way, despite repeated promises for months now, the government continue to sit on their hands steadfastly failing to release any of the state-owned stocks onto the domestic market. November soybeans closed at 9.93, down 6 cents October Soybean Meal at 326.30, up 3.50 points October Soybean Oil at 35.86, down 44 points. The crop progress report highlighted the continued delayed nature of the crop, saying soybeans were just 23% harvested compared to 49% last year and 57% for the five year average. Crop condition ratings also fell a little with 10% poor/very poor compared to 9% the previous week and 65% good/excellent compared to 67% the previous week. Latest weather forecasts look a little less threatening as far as cold is concerned but still remain wet. December corn finished at $3.81 ¾, up ½ cent March Corn at $3.93 ¼, up ¼ cent. The USDA crop progress report showed 13% of the corn harvested compared to 20% last year and 35% for the five year average. The report also said 74% of the corn was mature compared to 84% last year and 92% for the five year average. Crop condition ratings were the same as last week. 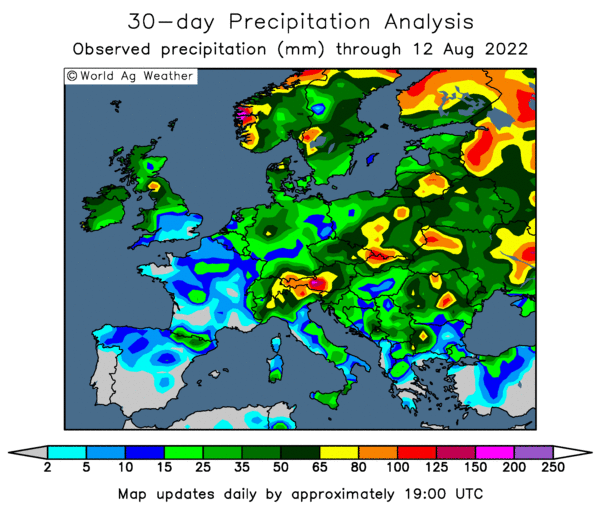 As with beans the latest weather models continue to show plenty of rain in the forecast, indicating that catching up this late harvest is going to stay a troublesome task. December wheat closed with strong gains at $5.11 ¼, up 17 cents. Delays in planting double cropped soft red winter wheat are in evidence, with the soybean harvest so heavily behind schedule. The USDA crop progress report showed winter wheat seeding at 64% compared to 69% for last year and the five year average. Emergence was at 39%, slightly behind the five year average of 40% and 3 points behind last years 42%. EU wheat continued to edge higher Tuesday with November Paris milling wheat ending up EUR0.50 at EUR128.25/tonne, and London November feed wheat closing up GBP1.45 at GBP104.70/tonne. Once again a weaker pound provided a boost for UK futures in particular, but short-covering is also becoming a feature with London prices now up 15% from mid-September lows. Consumers report a general lack of producer selling, even at these currently revised levels, which is flushing out one or two buyers. It is probably important however not to get too greedy or emotive, and keep a level head with prices now back up to more realistic levels. Some more farmer selling appears to be in evidence at current prices, although many are still busy drilling next year's crop. A report yesterday from the Centre for Economics and Business Research (CEBR) suggesting that UK interest rates look set to remain at 0.5% until at least 2001 appears to lend underlying support to wheat. They forecast that the pound will fall to $1.40 and "possibly below" 1 euro, as UK interest rates remain subdued for a length period of time. Sixteen Quid For A Beefburger? 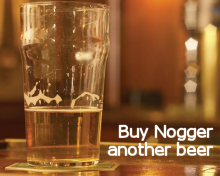 Latest news from the Nogger on Tour Circus. Woke up feeling 100% fine and dandy Saturday morning, developed a severe case of 'man flu' during the day as Mrs Nogger#3 helpfully refers to it, the heartless cow. Forced to produce a PowerPoint presentation against my will, my first ever, on the Sunday. Despite feeling like sh1te, and off my trolley on Lemsip Max Strength, eventually drag out my speech for Tuesday. Check into the hotel Monday night, starving hungry, have a few Buds in the bar just to be sociable. The barman, Sebastian, offers me a shuftie at the bar menu as I'm more than peckish. It's sixteen quid for a beefburger! A beefburger. Not even a happy meal, not a plastic Buzz Lightyear in sight, a chuffin beefburger. No coke option, nothing. That's a bit steep Sebastian old mate, I volunteer. "It is, how you say, 21 days mature," says Sebastian (he's not, how you say, 'from round here'). Christ! Sixteen quid and it's not even fresh! "It comes with, errr, hand-cut chips," adds Sebastian hopefully. It would need to come with Kylie hand-cutting them naked at the foot of my bed at that price I suggest. Unfortunately it doesn't. Despite coming down with a touch of man flu over the weekend, I am determined to honour my commitments and am off to sunny Stratford on Avon to do what I'd like to call a lecture. It's not a lecture really, more a few knob gags intermixed with a couple of graphs on soybeans & wheat prices, and a picture of Rupert dressed in his gay biker uniform. Then I'm off to the Hull Corn Trade Dinner Thursday, to take in the delights of the town voted worst place to live in the country 2005. So that my friends means that there will only be a minimal amount of blogging going on this week, EU wheat and CBOT closing comments and that's likely to be about it. For those who might be about to suffer withdrawal symptoms I'd recommend checking out www.agrimoney.com if you don't know it already, for a daily fix of agri-related stuff. It's completely free, which I know is a subject very dear to many of your hearts.